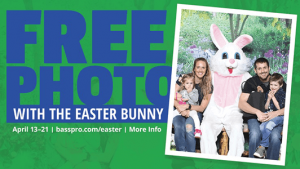 Free 2019 Easter Event at Bass Pro Shops April 13th – 21st! This is the perfect opportunity to get some free photos this holiday of your children for free. If you have a Bass Pro shop in your area take advantage of this offer! This would be great for those with little ones!